Clear Online Video's Stjepan Alaupovic walks users through Selective Color in the updated Lumetri color panel in Premiere Pro CC 2019. 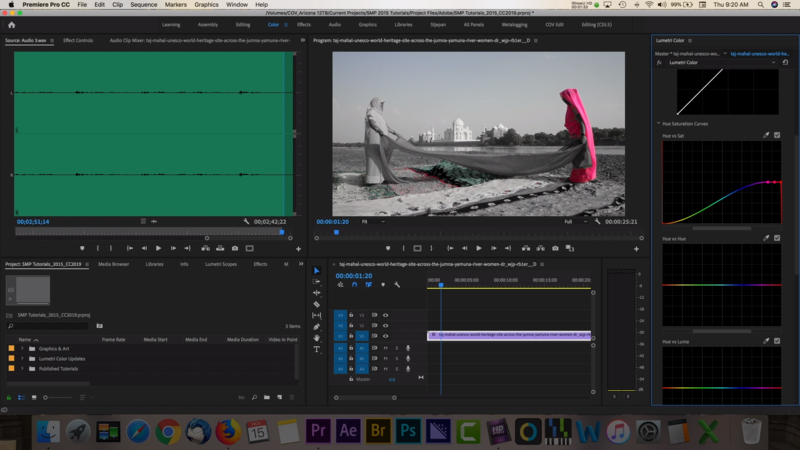 This tutorial explores the new Lumetri Color tools in Adobe Premiere CC 2019. This release came out in October of 2018. So be sure to update to the new version to see these features. I was pretty excited about this new feature and wanted to show you a quick way to create some Selective Color styles with these new tools. In Figure 1 (below), you can see I've got some footage on a timeline. And you'll notice that I'm using the Color workspace in this setup. 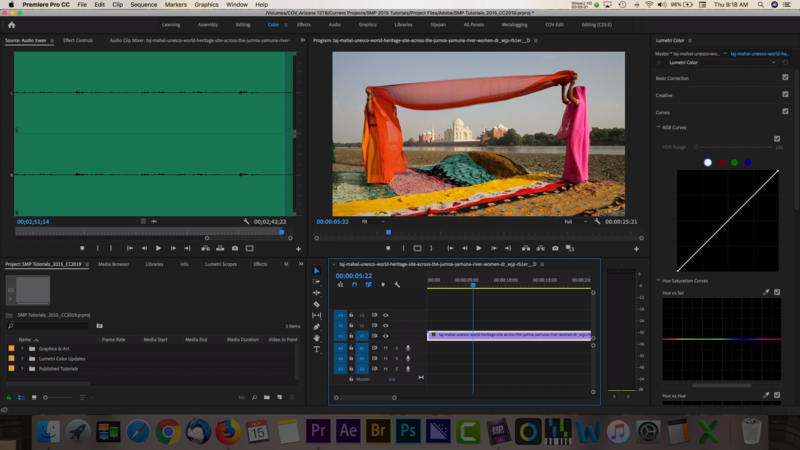 You can select any workspace by choosing the appropriate tab in the upper menu of Premiere Pro. Figure 1. Our project in the Color workspace. Click the image to see it at full size. On the right in Figure 1, you can the curve section of the Lumetri panel. This is where we're going to create a Selective Color look for this footage. Navigate over to the Hue/Saturation section. This is where we'll start. This area of the Hue/Saturation box allows you add keyframe points that work similarly to other curves and programs like Photoshop and After Effects. By adding keyframes to the colors and the range, we can choose to increase or decrease saturation and adjust the hue of the footage (Figure 2, below). Figure 2. Using keyframes to adjust Saturation and Hue. Click the image to see it at full size. So let's say I wanted only to have the pink hue from the woman's dress in color. We can mark these points in the pink range, as shown in Figure 3 (below), and then decrease the other areas to make the pink a selective color in our project. With a few clicks, we can create this stylized look that's been used in a lot of cinema and videos throughout the world. Figure 3. Marking points in the pink range. Click the image to see it at full size. Now, let's reset the look by selecting the arrow icon next to the Lumetri color tab. I want to show you one other way to really focus on a specific color. We can select the eyedropper tool to choose an exact color within the footage. This will add the keyframes for you on that color range and takes out some of the guesswork (Figure 4, below). Figure 4. Color selected using the eyedropper. Click the image to see it at full size. I want to take this one step further by using the Hue vs. Hue section below. This will quickly allow me to change the hue of the area we've segmented in this first step. By selecting a point and moving it across the x-, y-axis, we can completely change the color of our footage (Figure 5, below). You can preview the before and after by selecting the checkmark next to next to each area. Continuing down, you can edit the Luma, which will affect the brightness of the area you've selected. Figure 5. Changing the hue of the selected area with Hue vs. Hue. Click the image to see it at full size. All of these panels work in combination with each other and are essentially layered onto the footage. With a few clicks, we can create stylized footage with these new powerful Lumetri tools. Give it a try and thank you for watching. Clear Online Video's Stjepan Alaupovic discusses new YouTube export options in Adobe Premiere Pro CC 2019.